Welcome to Christmas In July!!! Read the following lyrics to the well known Jingle Bells Tune. Now you should feel right at home with me, because this is who I am. A 42 year old goof-ball! 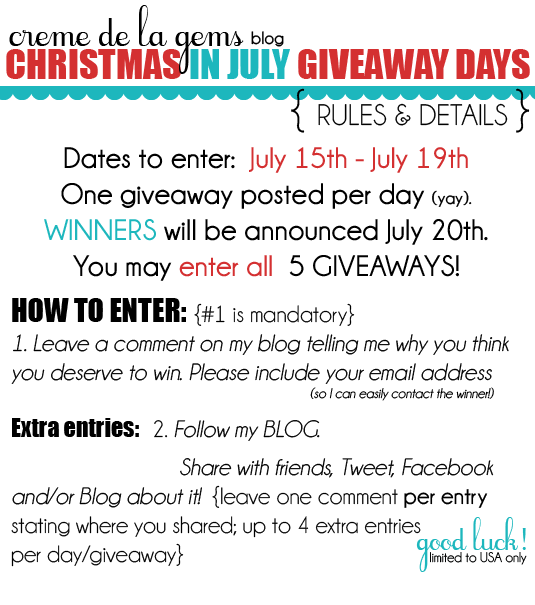 It's DAY 1 of my Christmas In July GIVEAWAY DAYS. 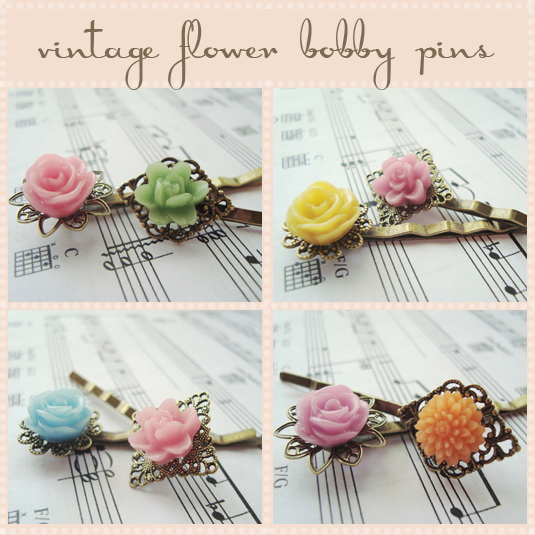 My first giveaway is FOUR sets of beautiful Creme de la Gems Vintage Bobby's! BUT if you aren't sure... read the details & rules below. I'll say it...I DESERVE TO WIN!!! :) I'm a stay at home mom and I work really hard! I would love to have something to make myself feel special and pretty! eeek! I LOVE all your sruff. I deserve to win because...um...im special? ;) And because my 2011 is going SOO much better than 2010 did and this would just push it over the top! I would love to win because I have 3 daughters and 7 nieces and spend so much money on hair accessories! It would be great to win! I follow you on GFC AND facebook because you ROCK! i'd LOVE to win because i am expecting my very first baby girl in a mere 2 weeks and little girls NEED hair pretties like the gorgeous ones on your site! You already know how much we love them!!! I deserve to win because I love everything you make. I love it so much it makes my teeth hurt. Following you and shared on facebook!!!! It's good to see you back!!! LOL! I'm afraid to win today because there may be something better tomorrow! I follow your blog....Just came across it the other day and love i! I deserve to win because I work really hard at everything i do and have never ever won anything!!! But seriously...would love to win and will post it on my facebook page too...Your stuff is seriously beautiful! I deserve to win because I'm a stay at home mom and work really hard and would love to have something pretty just for me! I am a mom of 3 boys and it would be so nice to have some girlie loveliness in my life like these pins!! Mary Jane Pilgrim, here; I deserve to win these for a little girl being raised by her father, no mom in sight. She's love these!